Please note that due to some issues that couldn't be resolved and the need to streamline my accounts, I will be posting all content on a new blog going forward. Welcome to the February 2017 Essentials by Ellen Release Hop! I’ll be showcasing several of the new products on my post today! 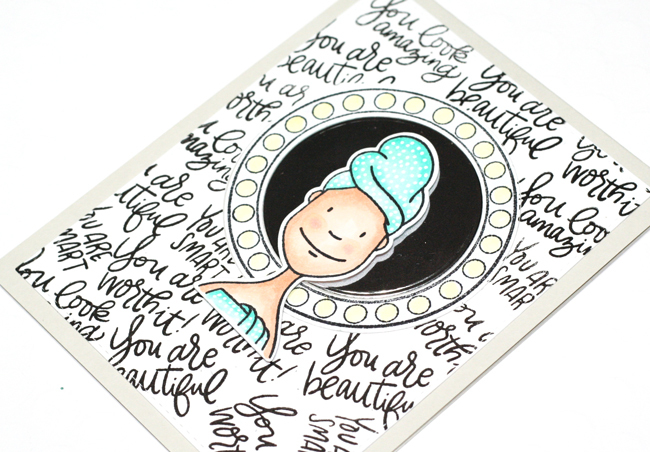 You should have arrived from the blog of the amazingly talented Brandi Kincaid! Stay tuned to the end of this post, because I’m giving away an Essentials by Ellen stamp set! For my first card today, I used the new Mirror Mirror stamps and dies along with the Spa Day stamps and dies to create a card that seems a little busy and wasn't the design I had originally intended, but I love how it turned out and I think it sends a great message! 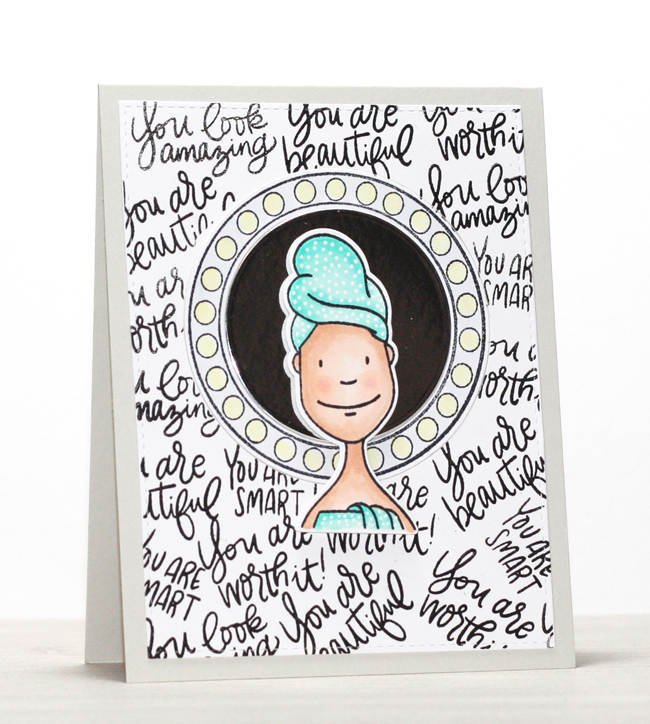 I stamped and diecut the mirror in the center of a white cardstock panel and then I added almost all of the sentiments from the Mirror Mirror stamp set around the mirror all over the white panel. I used foiled cardstock for the mirror and used Copic markers to colour the frame of the mirror and the lights. I stamped the woman image from the Spa Day stamp set onto white cardstock, coloured her in with Copic markers, diecut her and then adhered her in front of the mirror. 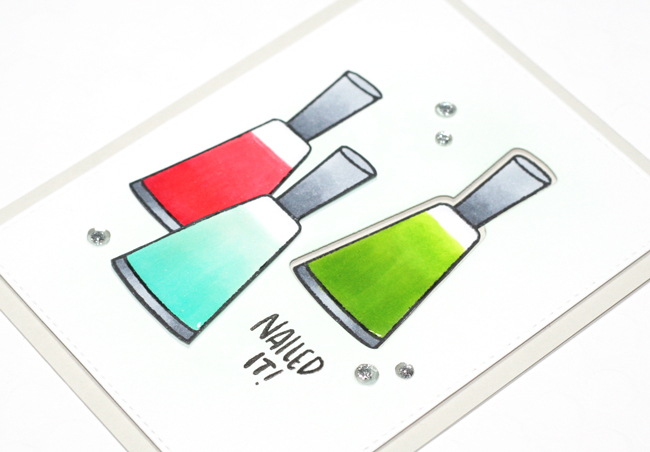 I stamped the nail polish bottles onto white cardstock with Tuxedo Black Memento ink and then I coloured each of them in with different colours of Copic markers. Once I was done with the colouring, I added Glossy Accents to the top of each one to make them raised and shiny. I diecut the outline of the bottle into the main white cardstock panel and then I adhered the panel with foam adhesive. I added the green bottle into the diceut opening, but adhered it directly onto the card base so it would be lower then the diecut panel. Leave a comment on this blog post for a chance to win today's giveaway! The winner may choose any in stock Essentials by Ellen brand stamp set (Maximum value $25 USD) at Ellen Hutson.com To enter, please leave a comment on today’s post by Tuesday, February 28! Your next stop on the hop is the awesome Emily Leiphart! Hello! 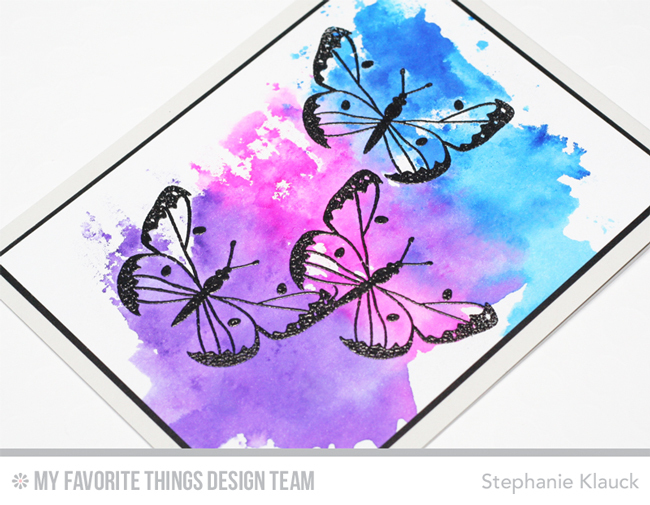 Welcome to the second day of the countdown to the newest card kit from My Favorite Things called Beautiful Butterflies! This month's kit is absolutely gorgeous and includes two stamps sets, a die set, black embossing powder, a Versamark ink cube, two sheets of translucent vellum and a beautiful assortment of cardstock. 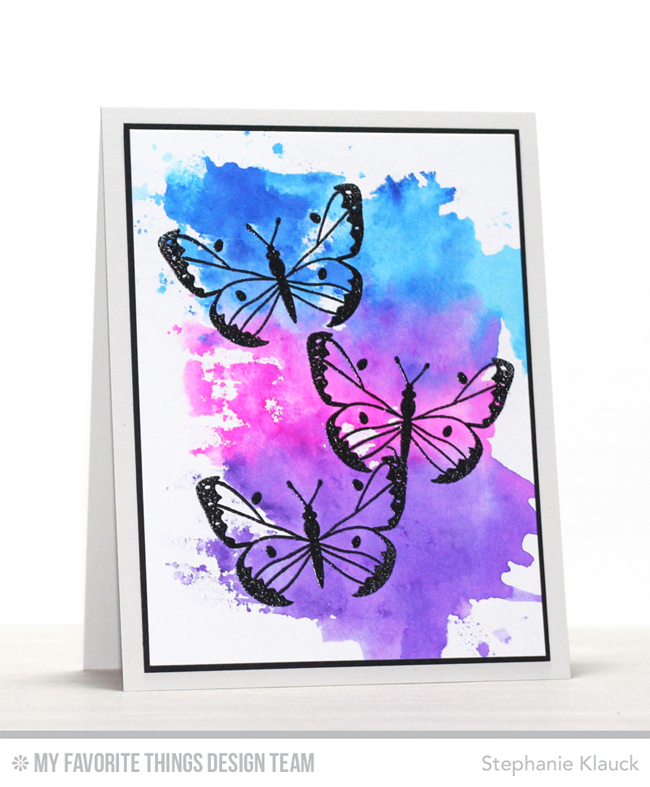 For my card today I used the largest solid butterfly image and stamped it three times onto watercolor cardstock using Distress inks. And since Distress inks aren't really great for image stamping (they're better for techniques) I used a paintbrush with water and painted over each of them after I stamped them to even out the colour and give them a watercoloured look. I stamped the sentiment onto a piece of white cardstock and cut it into a strip. I added black and white polka dot patterned paper to the sides of a top folding card base and then I added a white cardstock panel to the middle. I adhered the butterflies in the center of the cardstock panel and used foam adhesive under the top of the wings of the green and pink butterfly. I trimmed off the parts of the top and bottom butterfly that went off the card front. Hello! 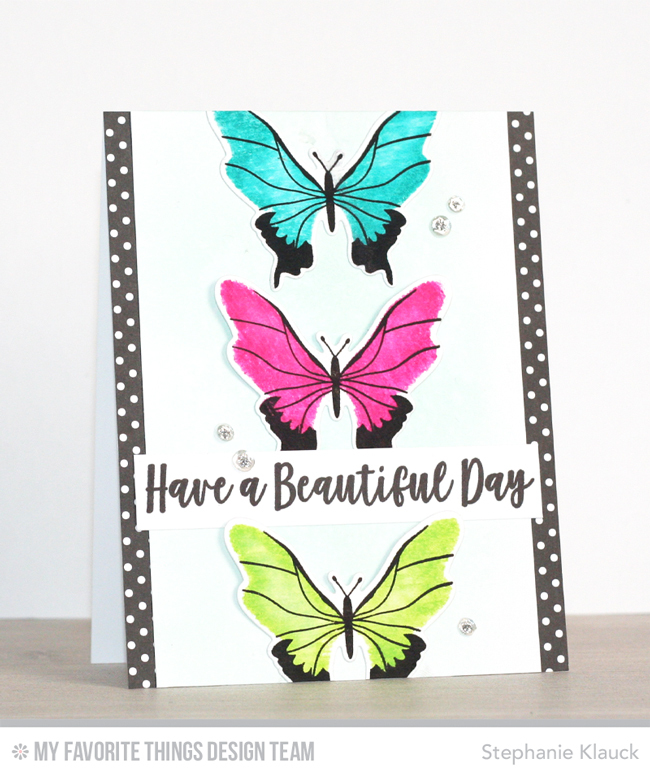 Welcome to day one of the countdown to the newest card kit from My Favorite Things called Beautiful Butterflies! This month's kit is absolutely gorgeous and includes two stamps sets, a die set, black embossing powder, a Versamark ink cube, two sheets of translucent vellum and a beautiful assortment of cardstock. 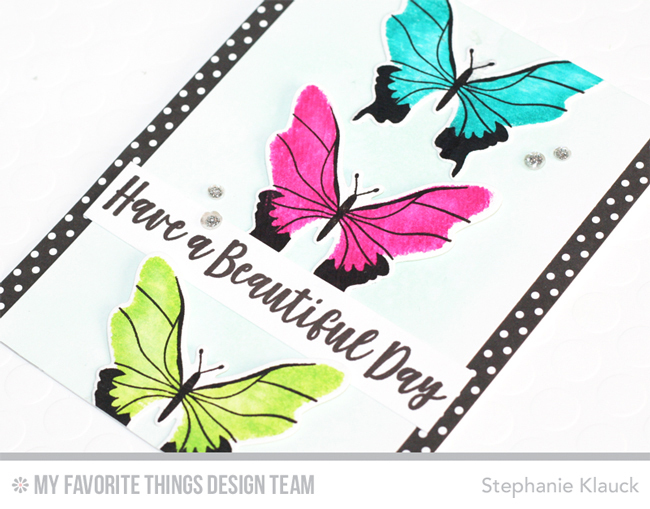 For my card today I used the detail layer stamp of one of the butterflies (all of the butterflies have multiple stamps that layer together) and embossed 3 black butterflies onto a watercolor panel using the black embossing powder from the kit. I decided to leave the front without a sentiment and instead, stamped it on the inside with black ink. I love the artistic watercolor look on the front and didn't want to cover any of it up with a sentiment strip. 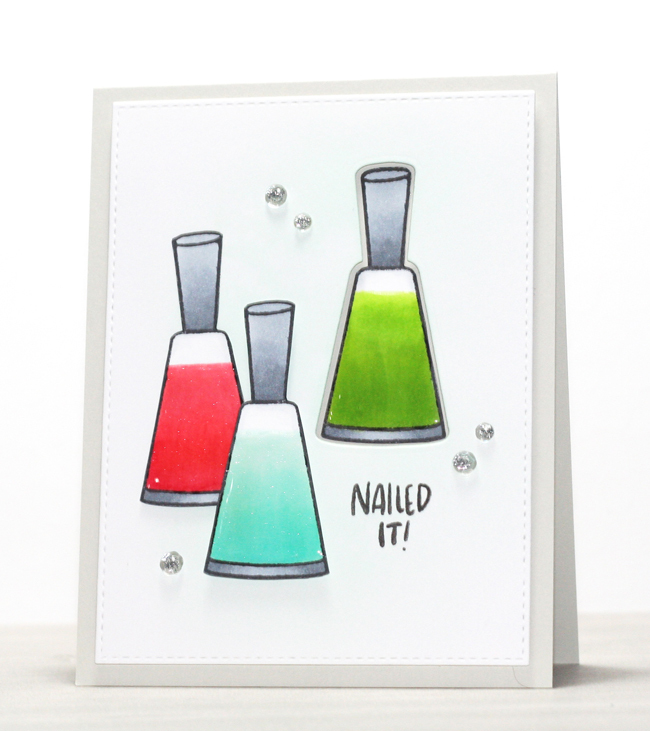 You can see how I created this card in this weeks episode of MFTv on the MFT YouTube channel (linked in my blog sidebar). For today's card, I used the new Sketched Blooms 2 to create a simple, but colourful card. I love this stamp set and the endless floral designs you can create with it! I stamped all of the leaves and flowers using various colours of rich, bold inks. I love the yellow, blue, orange and greens together... they blend and overlap so nicely together. 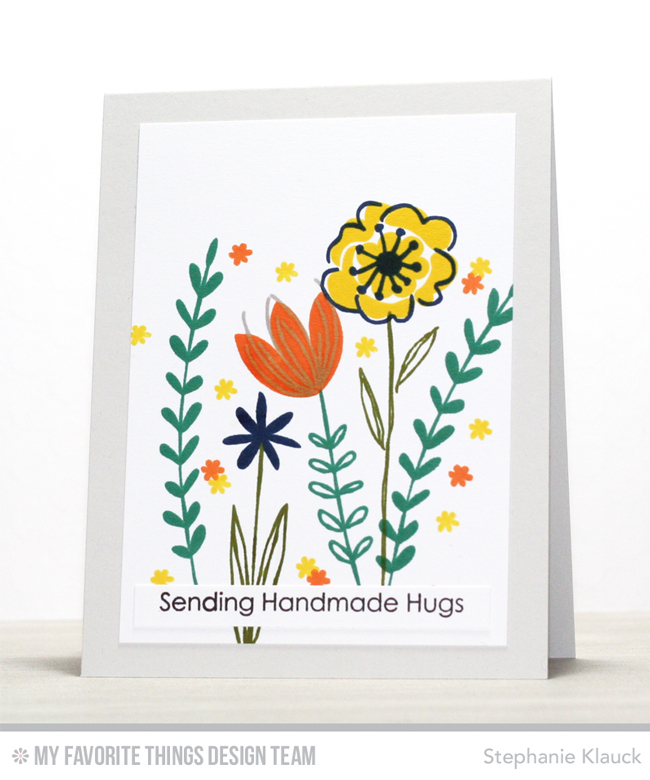 Once I had all of the flowers stamped and I was happy with the design, I used the little tiny flower stamp and added some yellow and orange flowers mixed in with the larger ones. I stamped the sentiment from the Lot's of Hugs stamp set onto white cardstock, cut it into a strip and adhered it onto the stamped panel at the bottom over the flower stems. I then adhered the finished panel to a Grout Gray card base. 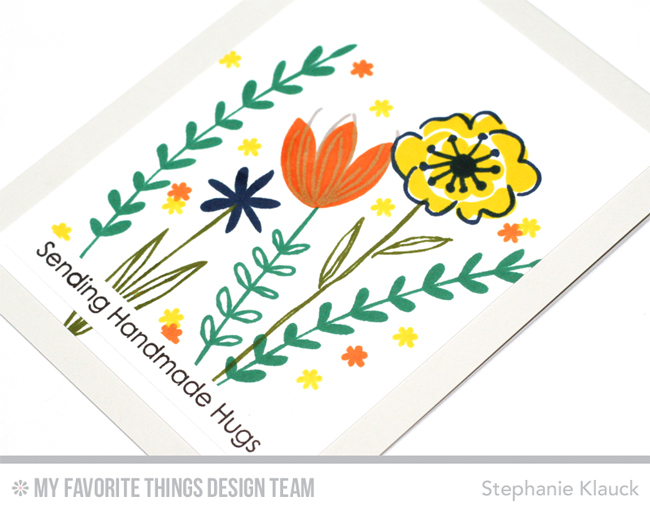 Hello and welcome to the New Product Launch for the My Favorite Things February release. All of the products that we've been sharing all week are officially available in the MFT online store! 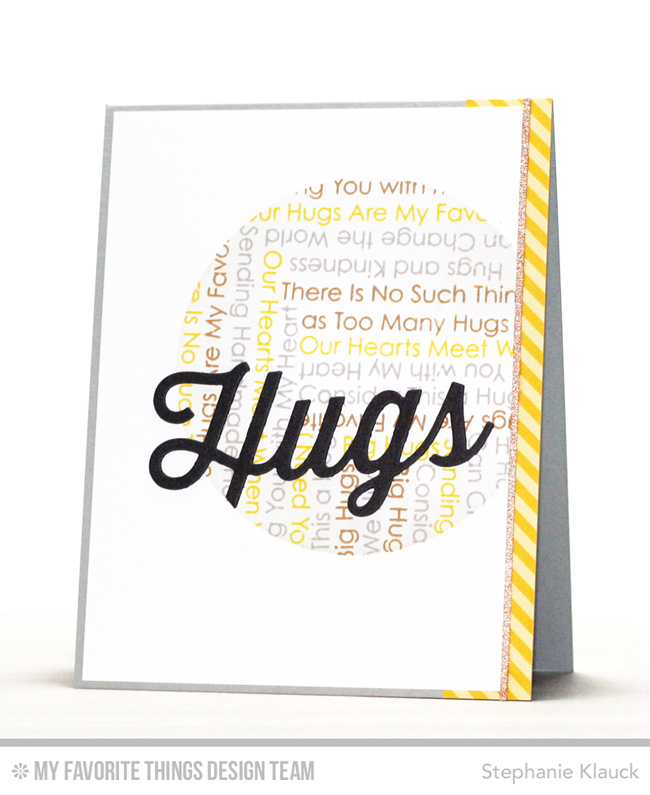 This card features my favourite products from this month's release - the Lots of Hugs stamp set and the Twice the Hugs Die-namics. You can find this months class (and all previous months classes) on the MFT blog in the Resources section on the sidebar. Thanks so much for joining me for new product launch for the February release. I can't wait to see what everyone creates with this months release!! Make sure to head over to the MFT blog for more ideas from the creative team and giveaways! Happy shopping!